Walk in Showers are a solution you must look at when it comes to easy access in the bathroom. Whether the room is created with a wet room former under the floor or with a low or level access shower tray, eliminating the need to climb into a bath or step up onto a high shower tray, allowing everyone to shower safely. At AKW, we are the leaders in offering cutting edge products and advice to ensure accessibility, design excellence and reliability for flexible, modern living. Whether it is our robust wet room solutions, our accessible kitchen equipment or our ingenious smart electric showers, our solutions are also cost-effective, while being quick and easy to install to ensure we always exceed the expectations of both end users and contractors. Are Walk in Showers an option you should consider? No problem, we can help. Take a look at our Q&A section below as we bust the myths about having a walk in shower. Will a walk in shower take long to install? No, not at all. A good quality installer should be able to install even the most complex of wet rooms within a matter of days, depending on your budget. It completely depends on which kind of walk in shower solution you decide on. A low access shower tray installation, for example, can be turned around within a day. Will it look like a hospital bathroom? It doesn’t have to. 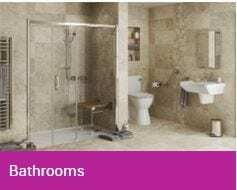 A luxurious and stylish wet room with fully tiled floor and a glass screen will look more like a luxury boutique hotel bathroom rather than a hospital bathroom. Again, the look and feel will depend on your budget, but there’s nothing saying that your bathroom has to look institutionalised. How do I go about getting one installed? You may be eligible for the Disabled Facilities Grant (DFG) which means that your local council will provide you with a grant to make changes to your home if you are disabled and meet their criteria. However, if you’re planning on paying for this yourself, your best start would be to contact your local contractor or specialist bathroom installer. Are you a healthcare professional looking to get a walk in shower installed for one of your clients? Great! Below we’ll talk you through the options you can choose from and the pros and cons of each. Pros: Usually the cheapest and quickest to install and will is less likely to create upheaval for your client within their home as little to no structural work is required. Cons: Not completely level access, meaning wheelchair users will require a small ramp to enter the shower area. This small lip can also be a trip hazard for people with limited mobility. Pros: Completely level access, so wheelchair users can enter the shower area easily. 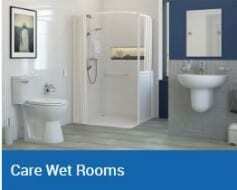 There are no trip hazards and this option is usually quicker and cheaper to install than a wet room. Cons: Usually more expensive and time-consuming to install than a low access tray as the floor will require either floorboard removing or the floor excavating. This can cause more inconvenience for your clients and residents of the home where the installation is happening. Pros: Completely level access without creating a colour contrast by using a shower tray. Better for people with dementia and older people as non-slip flooring can be used. Can also be made into a wider variety of styles depending on budget – with options for tiling and vinyl flooring. Cons: Usually the most expensive and time-consuming of all walk-in shower installations and can create the most inconvenience of the 3 with regards to the resident. Floorboards will need to be cut and removed or the floor would need excavation. Tiling can be expensive and vinyl flooring can be seen as less aesthetically pleasing. I’m an installer and want to offer more options when I renovate bathrooms. Brilliant idea, as we mentioned above, there are 3 main options – at least one of which you’ll be skilled at installing. But the others aren’t anything to be afraid of either for somebody with your skill set. You can view our installation videos here and we also provide training via our Toolbox Training Van and courses provided by the APHC. ‘Made Better’ is a phrase that runs through everything we do here at AKW. It’s in finding ways to make someone’s quality of life better through independent living solutions or improving our already exceptional levels of Customer Service. It’s in the superior quality and reliability if our products, many of which have a ‘Made for life’ warranty and which were constantly striving to make even better. It’s in making sure that all our deliveries arrive in full and on time and improving on the most extensive product range in the UK to make your life easier as a specifier, installer or customer. …and no matter how hard we push ourselves, we keep pushing, because we believe things can always be ‘Made Better’.